Farmersville Masonic Lodge No. 214 A. F. & A. M.
No. 214, A.F. & A.M. 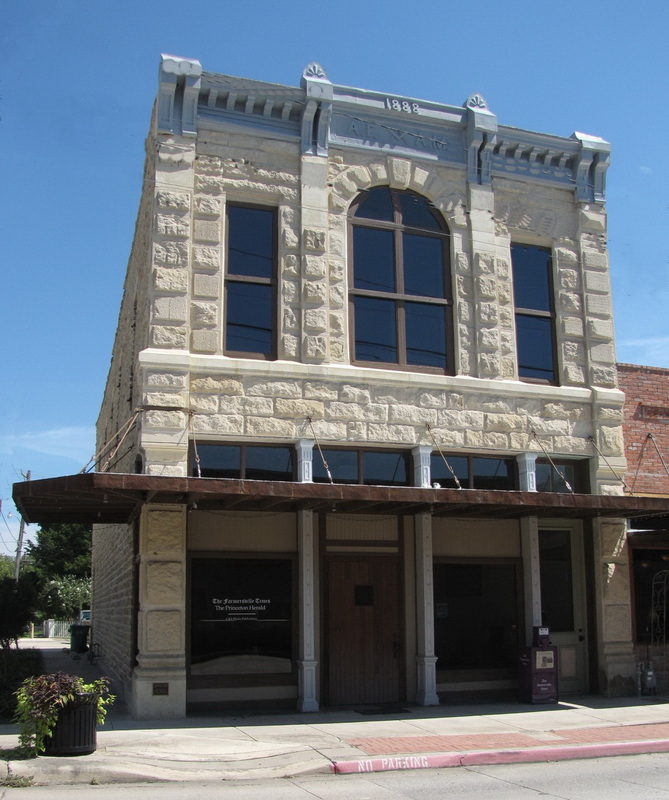 The Farmersville Times Building was built in 1888 as the Farmersville Masonic Lodge No. 214. It's an impressive 2 story Italianate design, built of locally quarried limestone, and named to the National Register of Historic Places in 2005. Today it houses The Farmersville Times newspaper office. The Farmersville Times printed its first issue on March 23, 1885, and is credited to be the oldest newspaper in Collin County. The Masons occupied the building until they built a new building in town. The building housed a number of businesses over the years, including a barbershop, grocery, and bakery. The Farmersville Times began its operation in this building in 1956. Chad Engbrock and his wife Sonia Duggan purchased the building and business in the year 2000. They knew then that they wanted to restore this gem. The total restoration of the Masonic Lodge began in June of 2005 and was completed six and a half months later, for approximately $300,000. The upper floor had been vacant for many years, but fortunately still had intact wooden flooring, the original metal ceiling, and other design details. Careful preplanning allowed the owners to accomplish their goals: to work with all existing interior and exterior design elements and bring the building back to its original splendor. The scope of work for the exterior included removing the slipcover, hand cleaning and repointing all of the stone, removing the bricks that had filled in the back windows and door, re-establishing the original arched side doorway entrance, reworking the windows, and replacing the roof. Interior work was equally extensive: The HVAC, plumbing, and electrical systems were replaced; the downstairs drop ceiling was removed; and the upstairs wooden floors were refinished. Care was taken to salvage the original upstairs metal ceiling, and to remove an overlay that revealed the original stage area. The beautiful front room stenciling was re-created, and historically accurate paint colors were used. Even the original hooks used by the Masons for hanging their robes have been retained. As a finishing touch, the owners landscaped the curb area just north of the building. A historian was engaged to conduct extensive research on the building, and a successful application made to the National Register of Historic Places. It is also a Registered Texas Historic Landmark. This research has shed light on the cultural significance of the temple. Lodge members voted to spend $4,375 to build the temple in 1888. On October 25, 1888 the cornerstone laying ceremony was held, and a uniformed local brass band of twenty-five members played in honor of the occasion. Sam Hamilton served as Worshipful Master when the Farmersville Masonic Lodge No. 214 A.F. and A.M. building was built, and he achieved the rank of Grand Master of the Grand Lodge of Texas in December of 1898. In 1954, Jack Ball became the second Mason affiliated with Farmersville Lodge No. 214 to achieve this statewide honor. "No one had used the upstairs in decades, except for creatures that should have roosted elsewhere. In spite of the mess the floors and ceilings were in remarkably good repair. The original meeting room was restored as it was. Care was taken to match paint colors to the turn of the century. You can almost hear the voices of a century ago when you stand in the room," says Chad Engbrock.